The stuffing steals the show! This is my favorite side dish at Thanksgiving. It is practically a meal within itself – the meat, the bread, the veggies, what more do you need? 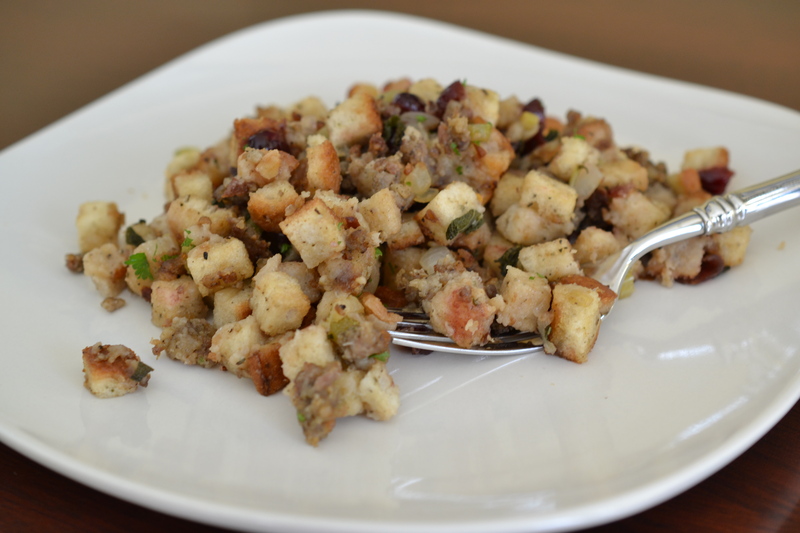 We have actually had the sausage stuffing as a main dish in the past, served with a side salad. It really can stand alone. But for Thanksgiving dinner, this dish accompanies the rest of the meal very well. Especially when it is topped with the turkey gravy! Oh my, I can hardly wait for the big day! I wait all year for this fabulous feast! Not eating turkey all the months prior, just so I can build up anticipation for this special day. And it is very much appreciated! 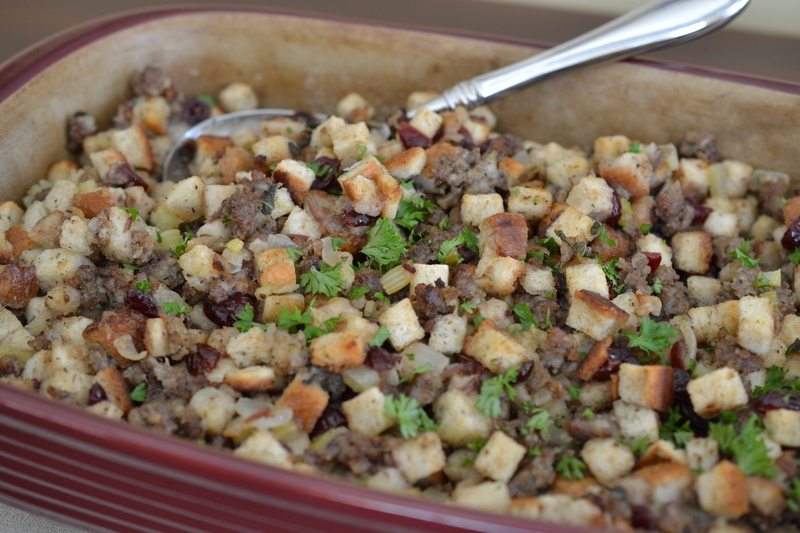 A few years ago, my son, Shane, started the tradition of making sausage stuffing for our Thanksgiving meal . Everyone loved it, so the tradition carries on. I modified his recipe just a bit by adding fresh sage and dried cranberries. I really like the sweet with the savory together. It is a perfect combination. This recipe is really very simple. You must give it a try. Start with browning the sausage in a skillet. When completely cooked through, remove from pan onto a plate lined with a paper towel to absorb the extra fat. Set aside. Chop the onions, celery, and sage. 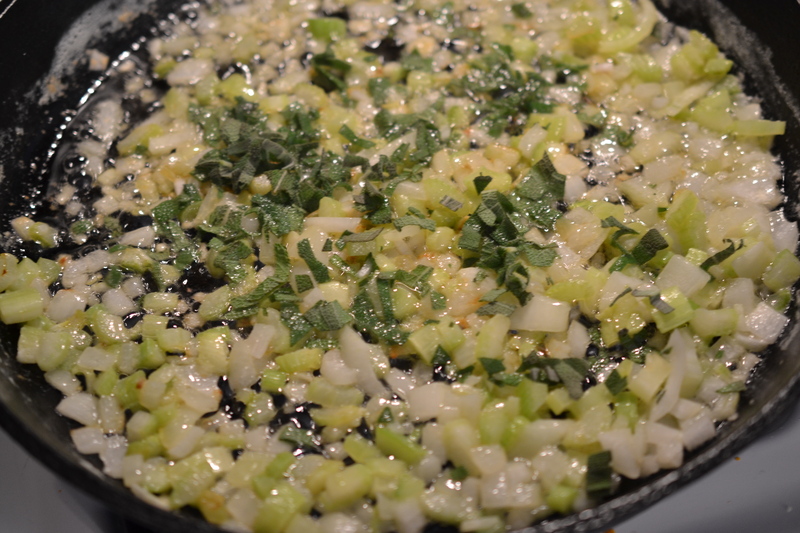 Sauté the onions and celery in butter. Add the chopped fresh sage. This is an amazing aroma! Add the cranberries and chicken broth, and bring to a boil. 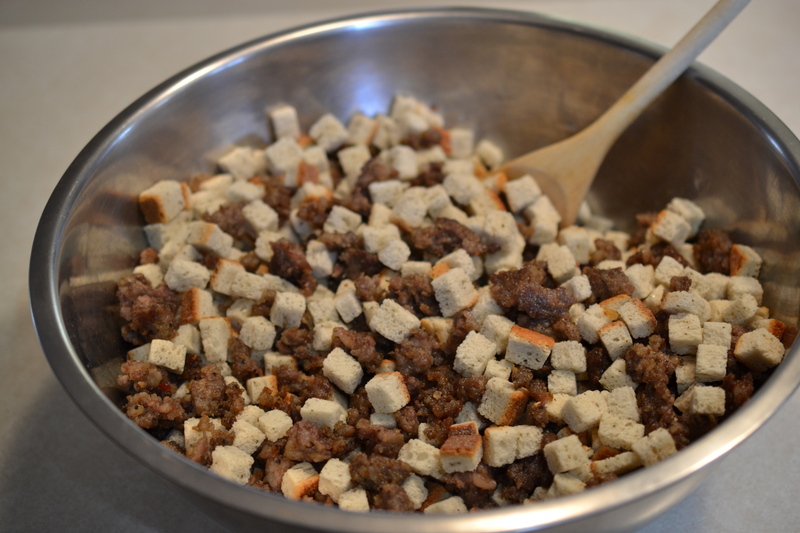 Mix the cubed stuffing mix and sausage together in a large bowl. 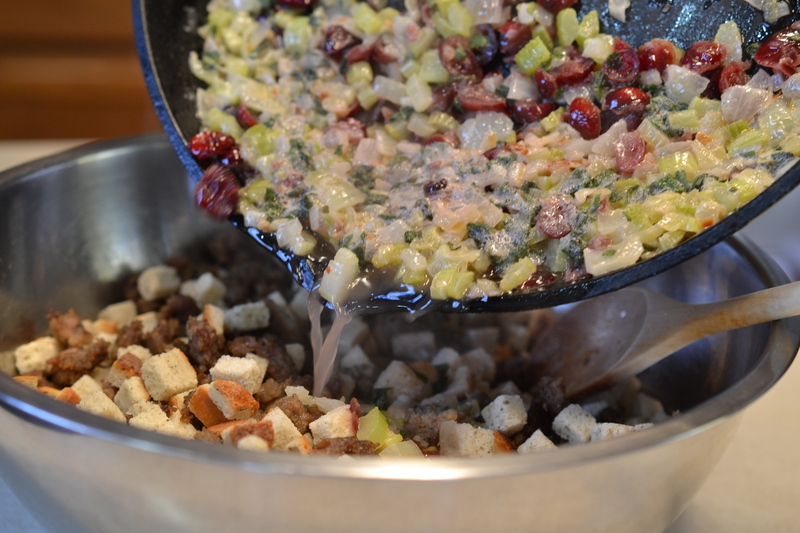 Add the onions, celery, sage, chicken broth, and cranberries mixture to the stuffing and sausage and toss until blended. Place into a 9×13 casserole dish. Cover. Bake at 350 degrees for about 30 minutes or until completely heated through. This recipe is so moist and flavorful! I made this in advance for Thanksgiving day, but we ate half of it as soon as it came out of the oven, because it smelled AMAZING and tasted so delicious! So, I guess I will be making a second batch. It is THAT good! Thanksgiving is a time to gather around the table with loved ones and friends, remember our blessings, and share all that we are thankful for. A family tradition at our Thanksgiving dinner is we individually proclaim what we are thankful for. Of course there are many things to be thankful for in our lives, such as our families and friends, good health, our jobs, delicious food, and lovely homes, etc. We are SO blessed! But we must always remember to thank our God, whom has made ALL these things possible! He is the Creator of everything. And He IS good! Psalm 136 reminds us of all the things the Lord has done and why we should give him thanks. The more you are aware of God’s presence in your life, the more you realize his amazing grace and his good blessings! Therefore, he deserves all the thanks and the glory! This year I am certainly thankful for my wonderful family and friends, my good health, my job, my home, and delicious food, and for YOU, for taking time to read this! But I am most thankful for my God for providing them all! I hope you can see all the good things in your life, and realize that ultimately, God has provided them! Give Him all the thanks on this Thanksgiving and He will bless you! I wish you all a safe and blessed Thanksgiving! Brown sausage in a skillet. Drain onto a paper towel covered plate. Set aside. Melt butter in a skillet. 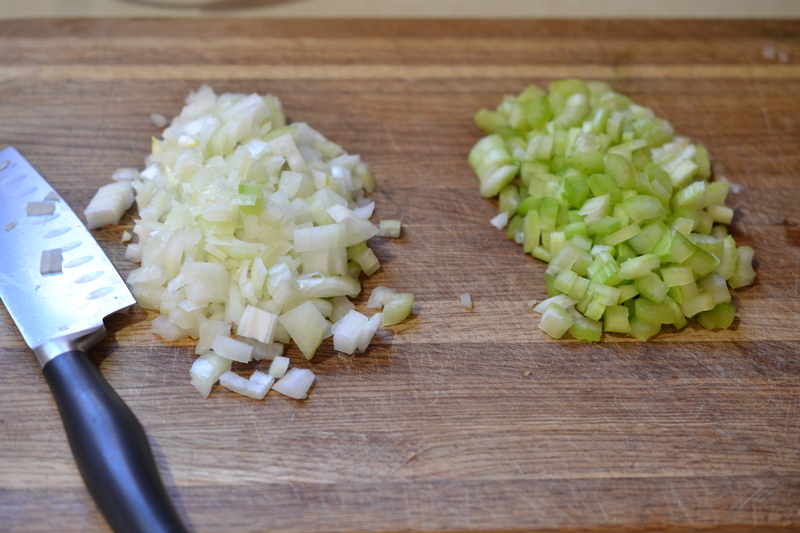 Add chopped onions and celery. Saute until soft, about 10 minutes. 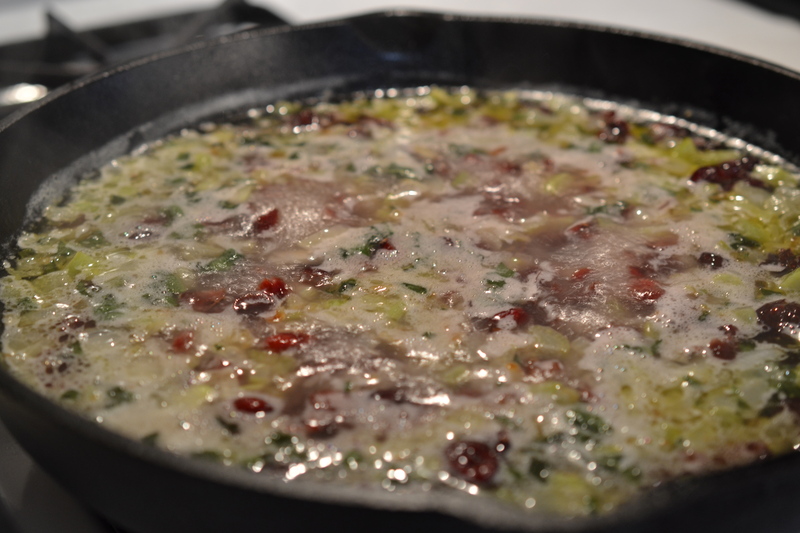 Add the chopped sage, salt, dried cranberries. Pour the chicken broth into the mixture. Bring to a boil. Simmer for 5 minutes. 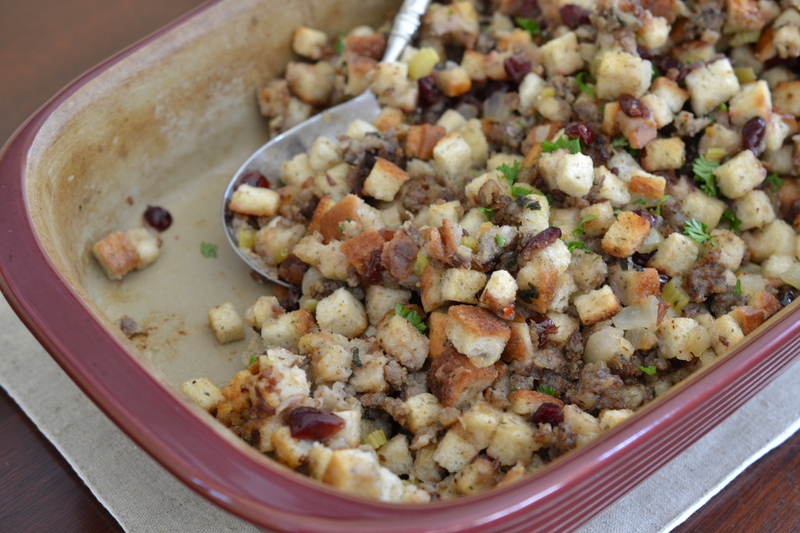 Put the cubed stuffing mix into a large mixing bowl. Add the sausage. Mix. Pour the chicken broth mixture into the stuffing and sausage. Mix until well blended. Spread into a greased 9×13 casserole dish. Cover with aluminum foil.